Healthy Pizza? Now that's an oxymoron if I ever heard one. But you needn't scoff at the idea, there is a way to eat gloriously tasty and nutritious home-made pizzas, that don't require arduous preparation. Well, my friends as they say 'where there is a will there is a way' and in my case there certainly is a will! Pizza, one of the great fast foods of our time is unfortunately, as its category suggests, a naughty 'fast-food' containing loads of fat and calories that weight conscious people wouldn't dream of touching. Have only ONE slice of commercial pizza, such as Pizza Hut's meatlovers and you will consume over 190 calories - in ONE slice! 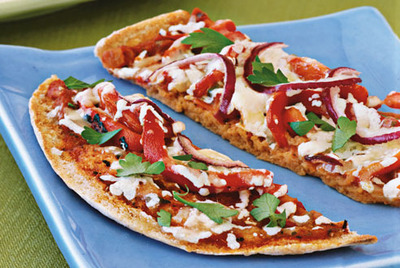 Upgrade that to a 14' cheesy crust pizza slice and you're ingesting 8 grams of fat and over 355 calories - YUK! All of these tried and true recipes have less than 300 calories. There are endless healthy combinations that you yourself can make at home, so get creative. Preheat the oven to 180C. Place pitas on two baking trays. Spread pasta sauce and crushed garlic liberally over the pita breads. Divide ham and pineapple between the two pitas and sprinkle with tasty cheese. Slide into the oven and bake for 10-15 minutes or until the bread is crisp and the cheese golden. Cover the pumpkin with hot water and teaspoon of salt and microwave until soft, should take 5 mins or more, depending on how small you cut the pumpkin. Preheat the oven to 180C. Line two trays with baking paper. Place pita bread, one on each tray and spread with Passata sauce and crushed garlic. Arrange the cooked pumpkin and roasted capsicum and crumble over the ricotta. Spray with a little bit of olive oil and slide into the oven. Bake for 15-20 minutes or until the pita is crispy and the ricotta is golden. Scatter fresh basil according to your taste. Preheat oven to 200C. Align two baking trays with baking paper. Spread passata sauce, crushed garlic and fresh tomatoes over the pita breads, and scatter with prawns. Place on the trays and bake for 15 minutes or until the colour of the prawns have changed and the bread is beautifully crisp. Crumble over the feta and lemon zest and fresh thyme leaves and top with spinach or rocket. Voila! #Handy Tip# It is always a good idea to have these healthy ingredients in the fridge and eliminate the junk food. Once you get rid of that temptation, you are much more inclined to wait that 12 minutes while your pizza cooks rather that grab that nasty packet of chips. So please don't wait until 2 weeks before summer comes around before you make those healthier choices. Making small changes to your eating habits are going to be much more effective than drastic ones. So remember consistency is key and taste essential. Get creative and try some variations of your own that will not only help you shed those unwanted kilos but also enjoy with the family. Bon Appétit! When: When you're time poor and hungry!